(Trent Nelson | The Salt Lake Tribune) Upset community members attend a meeting over worry that a ban on big trucks on Legacy Parkway is about to expire, unless the Legislature extends it. 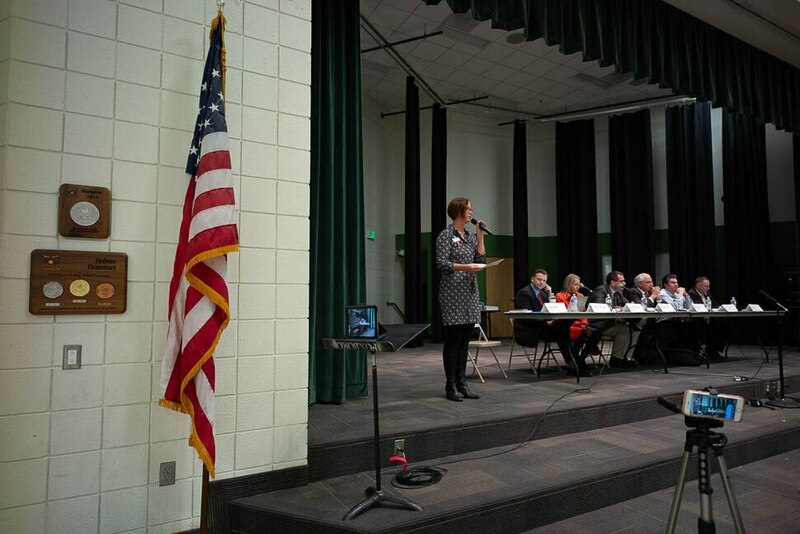 Angie Keeton opens the meeting at Foxboro Elementary School in North Salt Lake on Wednesday Jan. 16, 2019. (Trent Nelson | The Salt Lake Tribune) Upset community members attend a meeting over worry that a ban on big trucks on Legacy Parkway is about to expire, unless the Legislature extends it. 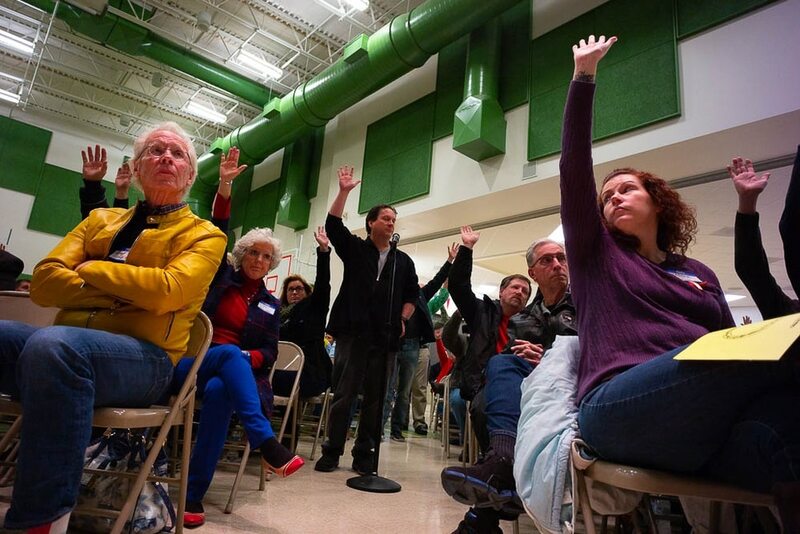 Residents raise their hand in support of not raising the speed limit on the Parkway during the meeting at Foxboro Elementary School in North Salt Lake on Wednesday Jan. 16, 2019. (Trent Nelson | The Salt Lake Tribune) Upset community members attend a meeting over worry that a ban on big trucks on Legacy Parkway is about to expire, unless the Legislature extends it. 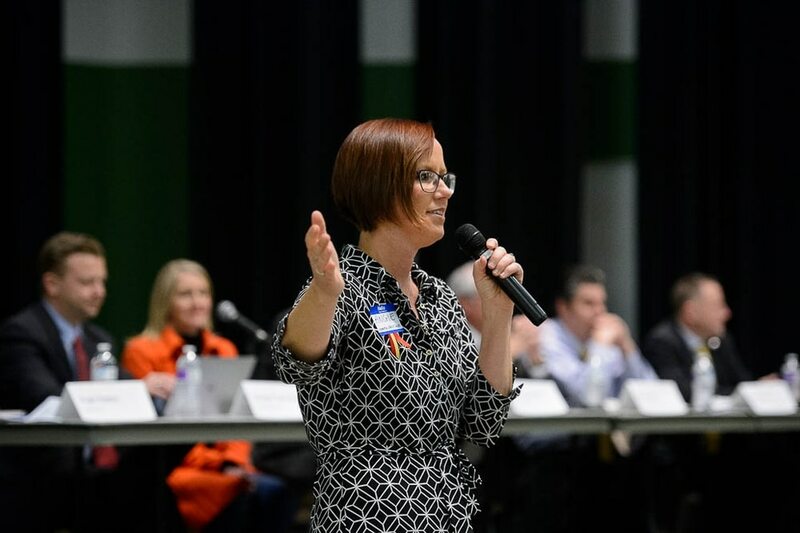 Angie Keeton opens the meeting at Foxboro Elementary School in North Salt Lake on Wednesday Jan. 16, 2019. (Trent Nelson | The Salt Lake Tribune) Upset community members attend a meeting over worry that a ban on big trucks on Legacy Parkway is about to expire, unless the Legislature extends it. The meeting was held at Foxboro Elementary School in North Salt Lake on Wednesday Jan. 16, 2019. (Trent Nelson | The Salt Lake Tribune) Upset community members attend a meeting over worry that a ban on big trucks on Legacy Parkway is about to expire, unless the Legislature extends it. The meeting was held at Foxboro Elementary School in North Salt Lake on Wednesday Jan. 16, 2019. (Trent Nelson | The Salt Lake Tribune) Upset community members attend a meeting over worry that a ban on big trucks on Legacy Parkway is about to expire, unless the Legislature extends it. Cynthia Sahm, a resident of Woods Cross, speaks in favor of keeping the truck ban during the meeting at Foxboro Elementary School in North Salt Lake on Wednesday Jan. 16, 2019. North Salt Lake • Standing on her porch, Angie Keeton can see the nearby Legacy Parkway. Instead of being repulsed by the freeway, she moved there three years ago to enjoy its trail system and “stunning” vistas toward Great Salt Lake. She loves the 11.5-mile road’s ban on big-rig trucks, its low 55 mph speed limit and its use of low-noise pavement that eliminated the need for tall sound walls. But she was floored by news stories that its truck ban, low speed limit and restriction to only four lanes will expire on Jan. 1, 2020 — which she says may ruin her now-quiet neighborhood. “The community Facebook page here is very active. So I asked if anybody knew about this,” she says. “About 95 percent did not,” and had bought homes like her on the incorrect assumption that the scenic parkway would remain as is. So Keeton organized a meeting Wednesday at Foxboro Elementary — which itself abuts Legacy — for residents to voice concerns, seek answers and beg area legislators to try to extend the truck ban. It drew a standing-room only crowd of 250 people. Rep. Melissa Ballard, R-North Salt Lake, asked the crowd how many want the big-rig ban extended. All but one person stood. Controversy over Legacy threatens to end a 15-year truce among many adversaries. Its special rules were implemented as a limited-time compromise to allow building the freeway after lawsuits by environmental groups had halted it by arguing early plans did not adequately protect Great Salt Lake wetlands and wildlife. Many residents now especially worry that the new inland port being planned west of Salt Lake City International Airport could turn Legacy into a busy freeway full of big rigs at all hours, increasing noise and air pollution in their neighborhoods. “We know that with the inland port going in, that is going to create a totally different traffic and transportation situation for everyone who lives near a major artery,” Keeton said. He said a temporary extension “could give you some breath and time to form some plans. Do you want to stay in Foxboro, do you want to stay in your home?” And the political climate may change in the future to allow a longer extension. For example, one group cheering the end of the big-rig ban is the Utah Trucking Association, which says it has waited patiently for 15 years for expiration of the special-rules deal it opposed. It views Legacy as a route that could greatly help truckers and the inland port, especially many firms with yards at its North Salt Lake end. Meanwhile, the Sierra Club of Utah, which led lawsuits that helped create Legacy’s design, says it is not ruling out new legal challenges if needed to protect the area. But Wednesday, the focus was what ending the big-rig ban could do to the subdivisions that have grown up along Legacy, and whether it can be stopped. Cynthia Sahm, of Woods Cross, said she lives four houses away from Legacy. “My daughter has cystic fibrosis,” and she worries about extra pollution. Bryce Bird, director of the Utah Division of Air Quality, told the crowd that the she has reason to worry. “Health concerns with diesel particulates are well known in areas with heavy diesel traffic,” he said. “The closer you are to the roadway, the more impact,” and he noted that Foxboro Elementary is adjacent to the freeway. “My home backs right up to Legacy,” said Kathy Carter, of North Salt Lake. She said she moved there nine years ago because of the nature preserve across the highway from her.